Wales coach Trish Wilcox praised her team's fighting spirit after beating Uganda to claim their highest Netball World Cup finish since 1991. A 64-41 victory in Sydney saw Wales finish in seventh place, giving them an overall record of four wins and four defeats from their eight games. Their previous best was also seventh when the tournament was last held in Australia 24 years ago. "The girls fought hard and we came up with a fantastic win," said Wilcox. "We felt we could definitely win this game but knew we'd have to go out there and earn it. "Uganda have been the surprise team of the tournament so we knew they'd come out fighting. We're really pleased." Wales won 49-47 when they faced Uganda in the tournament's first group stage. That followed a fine opening win over Fiji, ranked one place about them in seventh place, and a comfortable victory over Zambia. Top place in the group saw them qualify for the top eight group stage, but the step up in class proved beyond them, losing heavily to eventual winners Australia, third-placed England and South Africa. 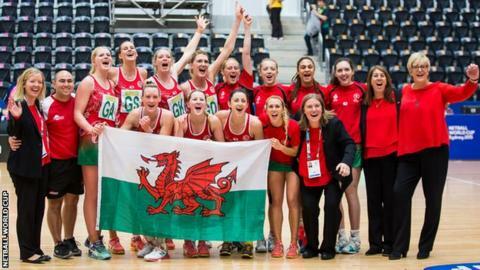 Defeat to Malawi in the first placing match meant seventh place was Wales' best possible finish, and Wilcox said they can be proud to have achieved it. "We started the tournament strongly by winning our pool, which was the first time a Wales team had done that," she told BBC Wales Sport. "That made us hungry to go as high as we possibly could. We wanted to leave in the best ranking place as we could." The Welsh set-up has endured a recent period of turmoil following the sacking of long-time coach Melissa Hyndman in 2014 on disciplinary grounds. In June, Sarah Jones took over as interim chief executive of Wales Netball, becoming the organisation's third leader in six months following the resignations of Mike Watson and Alun Davies. Wilcox believes a period of "stability" will now follow, and hopes the team's performances in Australia have inspired a new generation of players. "It's very exciting for us," she said. "We've had amazing support back home, the exposure has inspired lots of young girls to play sport so we're hoping this is going to have a knock-on effect for our participation numbers, which will lead to growth. "From there we're looking forward to developing are age groups all the way through so we can get some really good depth coming."